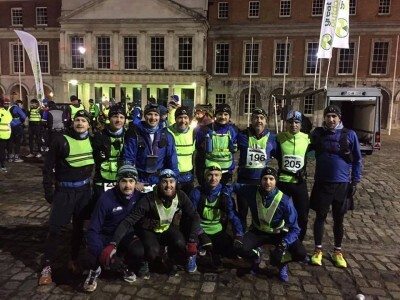 Sorry about this, I don’t really do short race reports, but if you’re willing to invest a few minutes to read this report then I’ll try my best to bring you into the race and give you a feel of what the experience was like for those that took on the Art O’Neill Challenge. In the lead-up to the race there was a lot of mixed feelings and expectations. 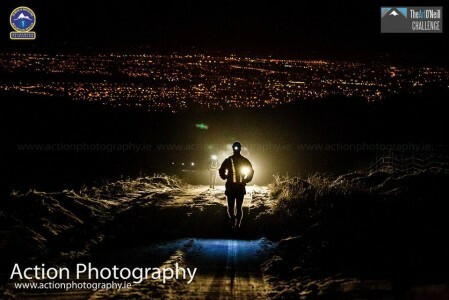 We had a great group heading up to take on Art O’Neill, and our preparation levels in the group were good including a solid recce a couple of weeks before the race so I felt we were in a fairly good place and everyone was looking forward to the challenge. On the flip side I had concerns because we didn’t encounter any snow on our recce and there had been some heavy falls on the mountains in the lead up to the race. Also I had the first 30kms on my mind – the previous year I had to drop out as I went out too strong and I seized up after the road run. This year I had been having some similar stiffness from the training hours and I had done even less road running so I wasn’t sure if I was pushing myself toward the same fate. But then I had come 2nd in Run the Line a few weeks previously against a strong field so I wasn’t in bad shape either. I knew pacing early on would be a big factor in the outcome so I was intent on engaging my brain first before letting my body cut loose on the mountain sections. On the week of the race I went through the usual routine of getting my kit together and planning the race. It takes me forever, I’m not sure why, laying the stuff out and double checking it. I have Barbara’s head wrecked in the house with race kit strewn all over the place, but it has become my routine now, etched into me like my own brand of OCD. On top of that I was generous enough to incessantly badger the lads with ‘advice’, whether they wanted it or not. I came up with a new concept – SMT – Single Minute Transitions, planning our transitions out to the point where they can be completed in less than a minute. It worked ok for me and Derek – I’ll let the rest of the lads tell you about how that one went for them – but I don’t remember soup, rolls, coffee, bonfires or TV interviews being on the SMT list J. The Friday evening it was Derek and myself on the carpool up to Dublin, Derek has been a great addition to the club since early 2015. He’s a seriously strong adventure racer and runner and we tend to match each other and support each other well in races. Stephen Geraghty was getting the train to Dublin, first class all the way, and meeting us in Dublin Castle. Stephen again is seriously strong, especially over rougher terrain, so the plan was that the 3 of us would race together and see how it went. I felt there was a chance that we could stay together and still put a good challenge on the podium places, who knows even fill them ourselves, but at the same time if it came down to it that any of the 3 of us were holding up the others then it had to be a case of cut and go. And we were all ready to do that, I hope! We all gathered in Dublin Castle and took in the buzz as we waited for the off. It was great to see the first timers taking in the atmosphere, Alan Webb, Philip Purcell, Joe Laffan and Jim Connolly all seemed a tiny bit nervous but even those of us who had been there before were feeling that. The time seemed to fly and before we knew it we were standing in the courtyard and the countdown had started! That came as a surprise to me cos I was messing with some piece of my kit and before I knew it everyone was running out the gate and already we were down the back!! Not the start I had planned but it was ok, there is plenty of Dublin ahead of us to go around people and no shortage of kilometres between there and Glenmalure. The key for me was to get into a comfortable rhythm and stay consistent. We ended up with a little GoTri pack of Stephen Teeling-Lynch and Martin Carey at the front followed by Derek Kiely, Stephen Geraghty, Alan Webb, Joe Laffan and myself. I had to reel them in a couple of times for going at a pace that I felt was too strong but these guys are strong athletes and I also didn’t want to reel anyone in that had the strength to go on and do better. We were in a larger group with other runners and as the kilometres ticked by we started to string out a little. Halfway through the run we passed Firhouse and started to climb on the road up to the mountains. The climbs seemed to go on forever and the progress was slow. These are the parts that you seem to forget each year that you do the race, the hardship on what should be the ‘straight forward’ road section. Eventually we turned off the road onto a smaller by-road which continued to climb and the surface quickly changed to snow and ice. Luckily there was just enough snow and clear ground for us to be able to keep going without putting on ice-grips so we just put the head down and kept chugging upwards. Everyone was digging deep here and the chat was sparse, but the focus was there, no doubt about that. 23kms in and we left the mundane behind and things started to get interesting, we had an alternative route worked out to the ‘suggested’ route which took us across some fields and rivers rather than on the road with the benefit being that it cut out a good section of climb on the road route. 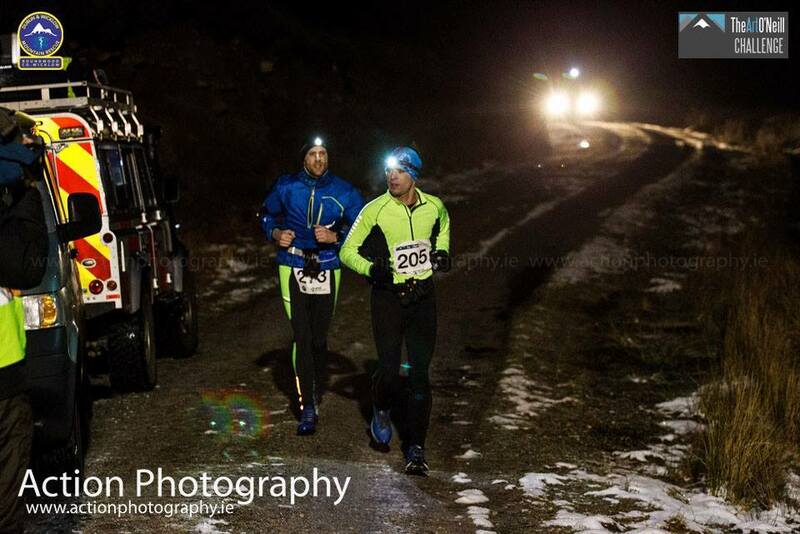 We got through it no problem, albeit with very cold feet, and it allowed Derek and myself to arrive into Checkpoint 1 in 6th and 7th place, not far behind STL and Martin Carey, and with Stephen Geraghty and Alan Webb just behind us. At this point I was wondering how many of my team members was I going to have to battle for a podium finish! It looked like we were all going to feature at the top end! Derek and I transitioned quickly and caught the lads a few hundred metres up the road, moving into 4th and 5th in the process. At this point the race moves off the road and trail and onto the open mountain. There are no trails, no landmarks that you can make out in the dark, you’re just following your navigated route and trying to make the best progress you can considering the incline and the conditions under foot. Initially the ground was soft but the snow wasn’t too deep so it was a slow, grinding hike up the initial section of hillside out of the forest. We started to make ground on the lads behind us. When we got further out into the open mountain the size of the task ahead became very clear. On the open ground the snow had fallen much thicker, and as we climbed and the temperature dropped it developed a frozen crust on top. Normally that’s good news because if you can run on the crust then you avoid all the complications beneath it. The problem here was that the frozen crust wasn’t hard enough to support our weight and each step ended up being a double exertion – first we had to break the upper crust and then push our foot down through the snow up to our knees – then repeat for the other leg, for hours on end. It was soul destroying but we got into a rhythm and took turns breaking the path in front with the person behind getting a small relief by walking in the footsteps. Those behind us could benefit from the trail we laid, but only if they stumbled across it in the dark! Derek at this point had taken a spill on some ice and had jarred his ankle, but he kept plugging on. I guess if you asked a physio they would tell him to ice it. He was definitely doing that. We took a pretty good route through the snow and started to stumble down the far side of the pass into the valley. We were constantly falling into holes hidden by the snow but every landing was soft so each time you just get up and go again. We made the river crossing and managed to maintain good progress to the forest entrance that leads to CP2. Going through the gate onto the fire road through the forest we were again met with a sheet of ice on the ground and Derek took another nasty spill, you could tell it was a sore one but again he brushed himself off, got up and kept on going. He’s made of tough stuff. I did a bit of Bambi on Ice but somehow managed to keep my feet and we got back to the job of moving forwards along the fire roads to Checkpoint 2. The route continues on fire road for a few kilometres where we took a nice shortcut through some felled forestry before turning off the fire road and following a river to a point where we had to put in the final steep climb of the race. In our minds at this stage we were on the verge of having the hard work done. All we had to do was nail this final climb, struggle across the top for 20 mins or so, and then we’d start the long descent home. Things didn’t quite go to plan. The route I had laid out took us up the right hand side of a waterfall/river, halfway up the climb we had to cross the river and complete the climb on the left hand side. For some reason my race brain told me to continue the climb all the way on the right hand side of the river thinking it would be faster and straighten the course for us. What we ended up being met with was an extremely steep climb where we had to crawl for sections, pulling ourselves up by heather and rocks. Time and again we came across walls of rocks that we had to pick our way around. The climb seemed to go on forever and our advantage eroded as every minute passed. One thing you get punished for in this race is route errors because the other guys at the top don’t make them, they know their routes exactly regardless of snow or darkness and they’re a lot more familiar with the area than we are. We hit some real lows during that climb, and when we came out on top the drudgery continued as the snow was very deep and progress was painfully slow. Whether it was the conditions or our state of mind our navigation again left a lot to be desired once we were on top and crossing Table Track Mountain. I felt like we were snaking left and right rather than following a defined line and a good indicator of that was the fact that we seemed to be jumping over the same bloody stream every 30 seconds! The stream was ambling left and right across the mountain but we could have just moved to one side or the other but we’ll just put that down to frozen race brain as well. Eventually we started a gradual downhill but there was nothing to be gained from the slope as the snow was still knee deep and it trapped all our forward momentum. Two things were really starting to bother me, one was the fact that we were coming across two sets of fresh prints which meant that 2nd place was gone. We’d messed it up. And since there were two sets together it meant that 3rd was gone as well because the guy in first was on his own and probably on a different route. Also on my right hand side I could see lights, I couldn’t make out if it was one head torch or two but I had to guess that we were now in 6th and 7th place. And I wasn’t happy with that and was steadily getting unhappier. After a while the snow started to soften slightly so that we no longer had to fight the crust, but the depth remained, so lifting the legs in and out was still an exertion. But whatever switch was flicked the desire to restore my placings became stronger than the pain in my legs. I had to say goodbye to Derek, who in fairness to him didn’t complain once all the way through despite being in some discomfort from the falls. His reward was for me to leave him on the open mountain while I went to chase down those ahead. The adrenalin started to flow and I found myself jumping out of the snow and launching myself forward in an effort to keep some sort of a running motion. It was excruciatingly difficult, and my legs and lungs burned, but somehow I found some sort of a rhythm. Picture a majestic stag leaping through deep snow. Then remove the stag and replace it with me puffing and panting and throwing my arms around like a lunatic while falling on my face every 50 metres or so. That’s pretty much the technique. I had lost sight of the two head torches to my right, probably while face down in the snow, so I had no idea if I had pulled ahead of them or not and as I continued to make good progress I picked out another head torch light ahead of me. That gave me renewed fight and I threw every ounce of strength I had left into the snow. It seemed to go on forever, jump up and forwards, up and forwards – and gradually the head torch got closer and closer to me. The open mountain ends on a fire road that takes us down into the valley to the finish line and my feet touched the fire road seconds behind the guy ahead. It turned out to be Gavin Hennigan, a guy whose list of adventures would put most bucket lists to shame. But I didn’t know that then so at that point he was someone that I had to get around. I knew I had 2 things in my favour that gave me a huge advantage – the terrain ahead was a long downhill, about 4kms, and it was very technical – my speciality. Plus I was full of adrenalin so I felt loose and my lungs were pumping well. I went past Gavan near the top of the trail and tried to push on in case there was anyone else I could catch before the finish. Another km down I saw another headtorch ahead, it was a longshot since it was a good distance ahead but again I put the head down and pushed on just in case. It turned out it was a guy walking his dog but it did give me a good boost and a few minutes later I was racing down the final stretch, crossing the river and over the line, still not knowing what position I was in. But I did know that I gave my all for the last 8kms, hopefully it might be enough to redeem myself somewhat. I dibbed, asked where I came and was absolutely delighted to hear that I had come back up into 2nd place. It turned out that the pair of prints I saw weren’t made by two guys in 2nd and 3rd running together, it was Gavan following the steps of Liam Vines in 1st place. I took the congratulations of the hardy bunch of people at the finish line, tried not to curse into the tv camera and sat to wait for Derek to cross, I knew he wouldn’t be long. The adrenaline was still flowing so I didn’t really know what to do with myself so I just sat there beside the line looking a bit mental. Gavan crossed in the meantime and gave me a good handshake and Liam Vines came over to exchange congratulations and to share our opinions of the hardship we just went through. Supporter extraordinaire – Eleanor Ryan, fiancée of Brian Meskell, was there at the line to cheer us home too and she stayed at the line until the Meskell posse were in. At that point our thoughts turned to getting warm so we had a quick clothes change, a cup of tea and we went back to the line to cheer the rest of the gang home. Everyone crossing the line shared a similar story of extreme hardship during the race and it would be only afterwards, on reflection, that they would realise the most important detail about the hardship they had passed through was that they had successfully overcome it. They had proven themselves tougher than what they had faced. And there’s a real beauty in that. It very quickly overcomes the memory of the pain felt. I’ve seen it every year. And this year all the gang crossing the line said it and I said it myself. “I’m never doing that again” – but I have to say this year was the quickest U turn I’ve ever seen. We were barely home when the messages about wanting to give it a go again next year started to flow! We’ll be back, a lot wiser and maybe even a bit quicker. Maybe you could join us?